We're back! I hope you all enjoyed your holiday week. I have to admit it was nice to be away from a computer (besides pinning on my iPhone). But I'm glad to be back! This week I'm sharing all things Chevron. 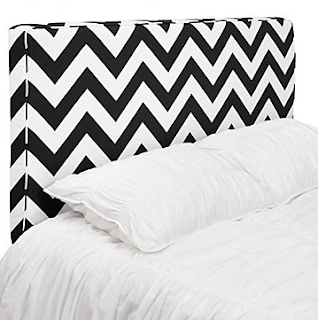 Get the look of a custom headboard at the fraction of the price with this Chevron Headboard from Z Gallerie. Perfect for the teen in your life (or a punchy guest room). Add some neon or really any bright colored pillows and you are done!